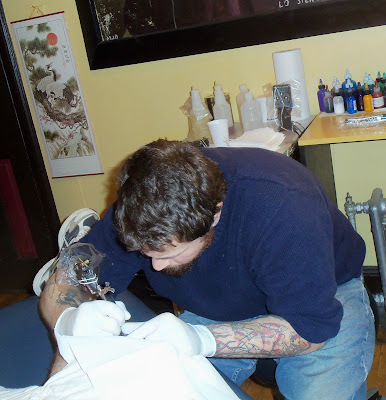 Occasionally in my wanderings, I will meet not just tattooed people, but tattoo practitioners, and often those visiting from outside of New York City. So it was no surprise, when I approached a gentleman across the street from where I work, at 31st and 7th, to learn that I was talking to an artist. 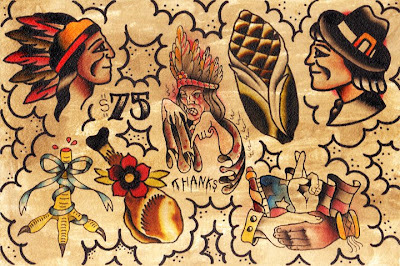 Working out of Punkteur Tattoos & Piercing in Joplin, Missouri, Derek "Dirtbird" Wieberg estimates he has 130-150 hours of work inked on his personal canvas. It seemed fitting, considering his name. Dirtbird praised the artist, Rick Pierceall at Karma Tattoo in Tulsa, Oklahoma, who has done all of his throat work. That's not Dirtbird, but it's his handiwork! The owner of this tattoo is Shawn, who had the good fortune to be inked by Dirtbird. They collaborated on the design together. 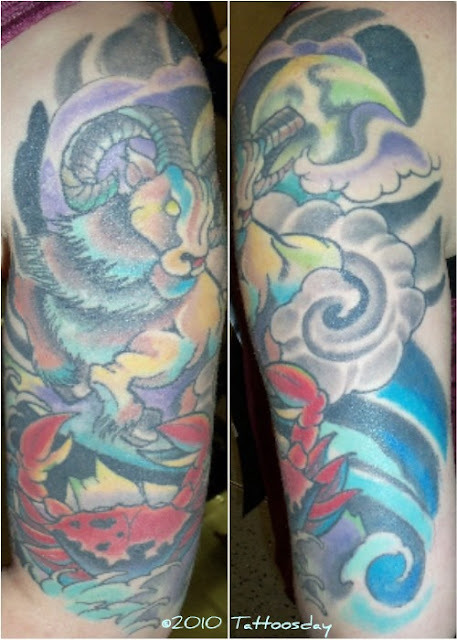 Thanks to Dirt Bird and Shawn for sharing their tattoos with us here on Tattoosday! Tune in tomorrow to see a tattoo from Katie, aka Mrs. Dirtbird! In college we had a game room at the Student Union. I claimed to be a master at Arkanoid, but would occasionally play pinball. Earthshaker was fun, but there was another, carnival-themed game that would often beckon, "Ride the Cyclone!" It was, naturally, called The Cyclone. 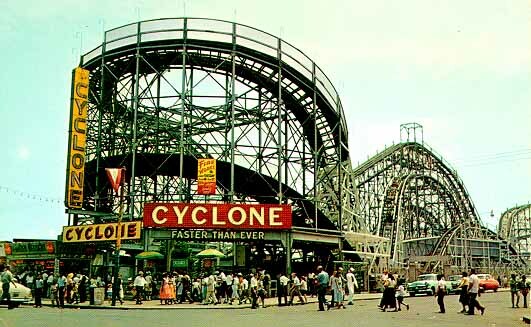 Fast forward ten years and I would be residing in Brooklyn, home to Coney Island and the original Cyclone. Despite having been in close proximity a number of times, I've never gone for a ride. I was reminded of this back in September when I met Matt at the top of the escalator at the Penn Plaza Borders store. 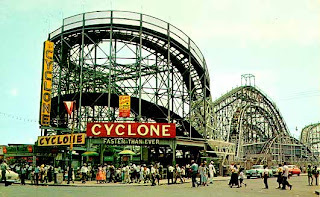 This is, of course, the Cyclone. Matt is working on a Coney Island/"Carnie" theme, having lived in Brooklyn most of his adult life. 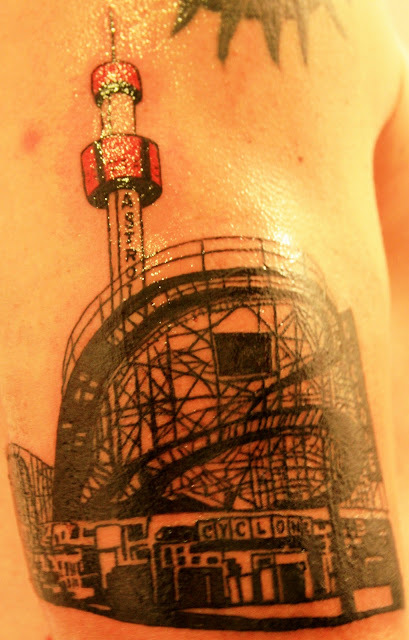 Thus, the Astroland tower behind the Cyclone in the tattoo. Next up: the Wonder Wheel and the Parachute Jump, other Coney Island attractions. Matt credits this tattoo to Ping at Village Rock Tattoo in Manhattan. Thanks to Matt for sharing this great tattoo with us here on Tattoosday! I met Nadya one afternoon in the beginning of October in Borders on Penn Plaza. Nadya told me that she wanted something "girly". 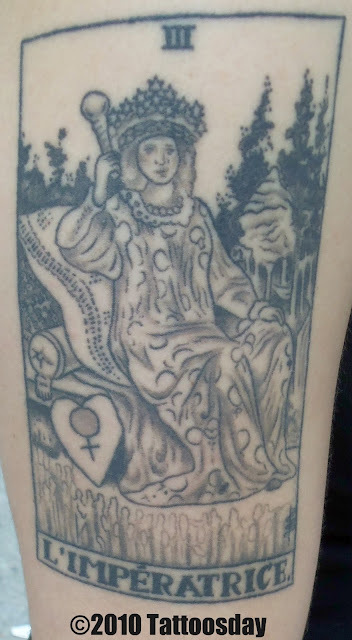 What I found most interesting about this tattoo is that when I asked her who the artist was, she told me it was her father. I can't imagine tattooing my own daughter. I would be too nervous! Thanks to Nadya for sharing this tattoo with us here on Tattoosday. This was done at Hand of Glory in Brooklyn yesterday as part of the shop's $75 Thanksgiving Tattoo Special and was sponsored by Troll Skin, produced by Skin Actives Scientific. 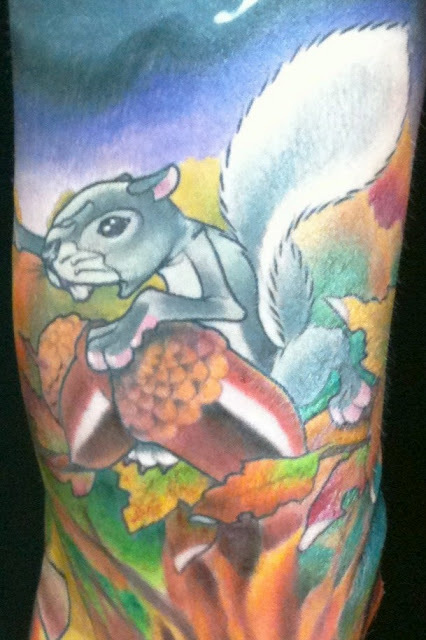 I was fortunate enough to have Brian Faulk as my artist again. He had inked my Friday the 13th tattoo last August, and I appreciate that he works quickly and concisely. In consideration for their sponsoring this tattoo, I will be exclusively using Skin Active's product, Troll Skin Aftercare over the next two weeks as the tattoo heals. I can already say I am pleased with the aftercare cream because it is a lot less messy than the ointment I am used to using within the first 72 hours after getting a tattoo. I'll report back then on how their product held up compared to the regiment I've followed in the past. This belongs to Rich, a musician and rap artist. He's a big Harry Potter fan, as exemplified by the magic wand. The snake at the base of the wand not only symbolizes infinity, it is a nod to Severus Snape, a character associated with the House of Slytherin, of which the serpent is the mascot. The concept of the tattoo is exemplified by the music coming out of the wand, illustrating that sounds can be magical and that Rich is under music's spell. The piece was inked by Chris at Lady Luck Tattoo Studio in Montville, Connecticut. When I met Rich, he was sitting with his girlfriend in Penn Station. She introduced herself as Kytti, and asked if I wanted to see her tattoo. Kytti explained that this represents her and Rich together in Japan. They've been together for over a year and they'd both love to go there together and experience the culture. The tree is filled with cherry blossoms, a flower often associated with Japan. Chris at Lady Luck also was the artist behind this tattoo. 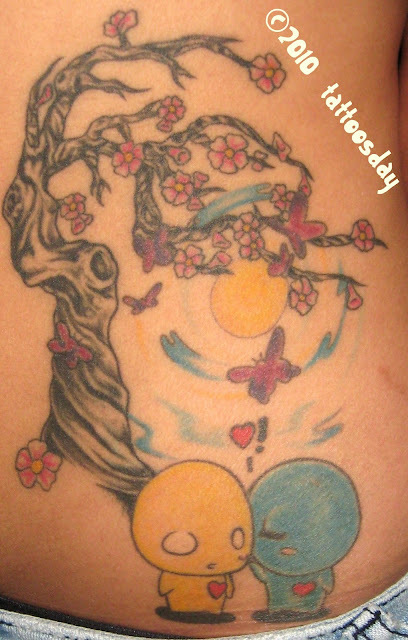 Thanks to Rich and Kytti for sharing their magical and romantic tattoos with us here on Tattoosday! I met Tom in a drug store in my neck of the woods in Bay Ridge, Brooklyn. This piece celebrates his lineage, honoring the family crest from his grandmother's side. 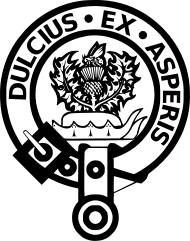 The Scottish part of him is descended from the Clan Fergusson.The clan motto Dulcius ex asperis means "Sweeter after difficulties". This was tattooed by Lou at Third Eye Tattoo, in the Park Slope section of Brooklyn. 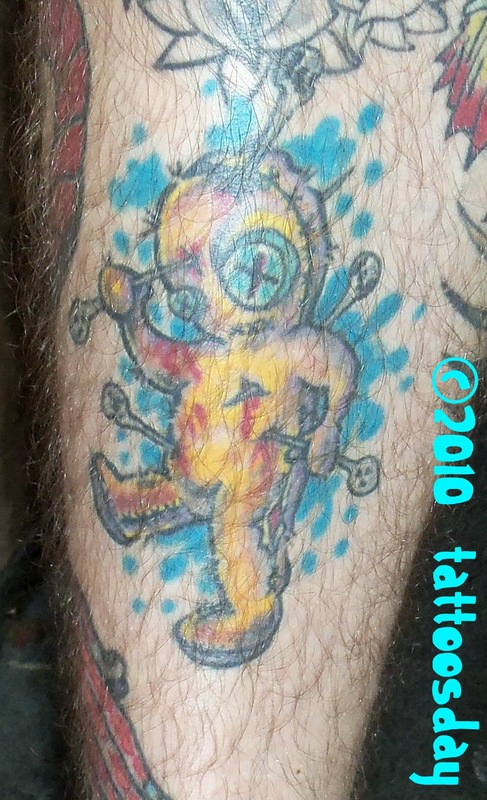 Work from Lou and Third Eye that has appeared on Tattoosday can be viewed here. 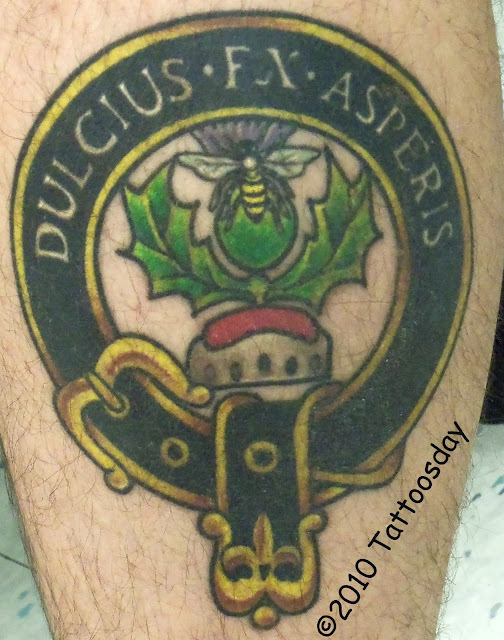 Thanks to Tom for sharing his family crest with us here on Tattoosday! 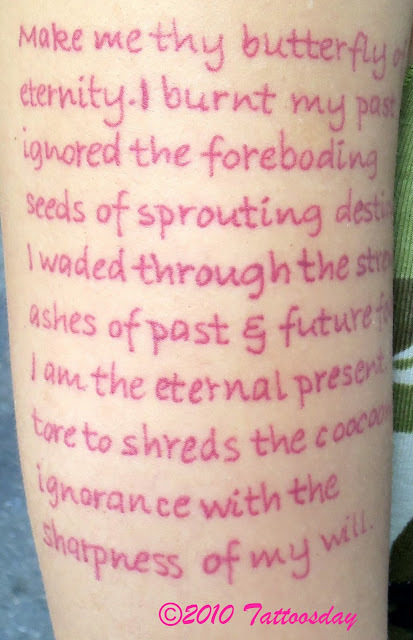 One of the unexpected joys in inkspotting is approaching someone about a tattoo and having them reveal one that is so much better than the piece you approached them about. It's like receiving a bonus for being curious. Such was the case with Katie, who I spotted in Penn Station when I noticed a tattoo on her ankle. This is an astrological tattoo and features the signs for Cancer (the crab) and Aries (the ram). Katie explained that she is a Cancer, with Aries rising. What this means, astrologically, could take pages and pages of analysis, but Katie explained that the two personalities are both strong and that they traditionally don't get along, which is why she has this relationship depicted as the two symbolic creatures battling in a stormy landscape. It is one interpretation of an astrological description that lends itself to her personality. Here's another. Katie credited the artist Christian Masot at Silk City Tattoo in Hawthorne, New Jersey, for this tattoo. She estimated it took about seven hours total in three sittings to create the finished product. Work from Silk City has appeared on Tattoosday several times before (see this tag), but this is the first piece we've seen by Christian. Thanks to Katie for sharing this awesome tattoo with us here on Tattoosday! I immediately recognized the name as one of the characters in Richard Adam's wonderful novel, Watership Down . He basically wanted something that was nature-based and gave the artist, Keller at Classic Tattoos in Pinellas Park, Florida, free reign on the design, allowing him to pretty much free-form the sleeve. The collage at the top of the post consists of my shots in Penn Station, but the detailed photos are based on the pictures Andy generously sent me after the fact. 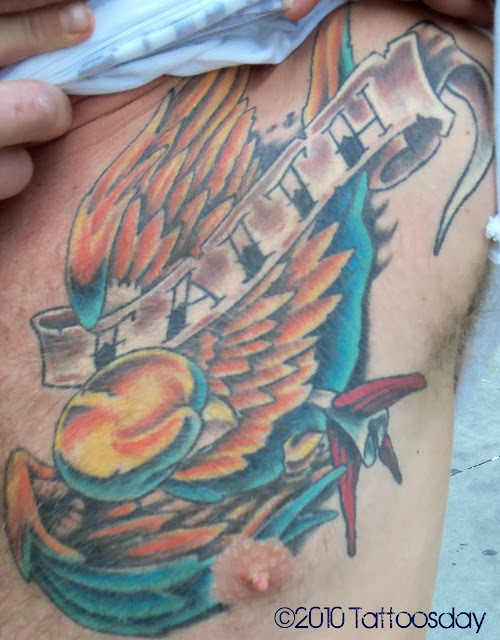 These detailed photos show the brilliant colors and exquisite detail that Keller put into the tattoo, which Andy estimates represents about 18-20 hours of work. 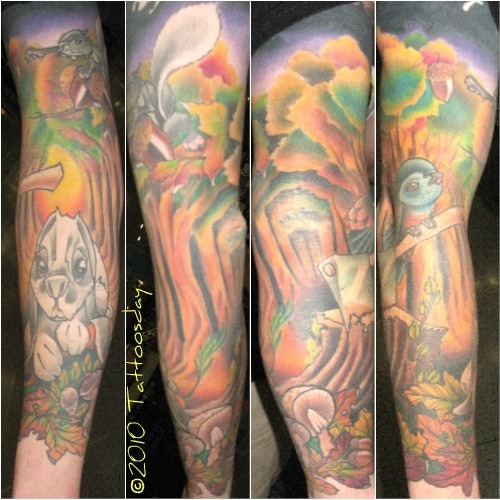 Thanks again to Andy for sharing this amazing sleeve with us here on Tattoosday! I met James, along with his two friends (whose tattoos were shared here and here) as they were headed to Comic Con in New York last month. This tattoo is the an interpretation of a scene from The Walking Dead. Photo by Scottso, from his MySpace page. Thanks to James for sharing this cool tattoo with us here on Tattoosday! I mentioned in my last post that I met three guys on their way to New York Comic Con when they stopped and shared their tattoos. This piece, on his forearm, is a bleeding rose. It was tattooed by Christopher Wilkie at Peter Tat-2 in West Hempstead, New York. 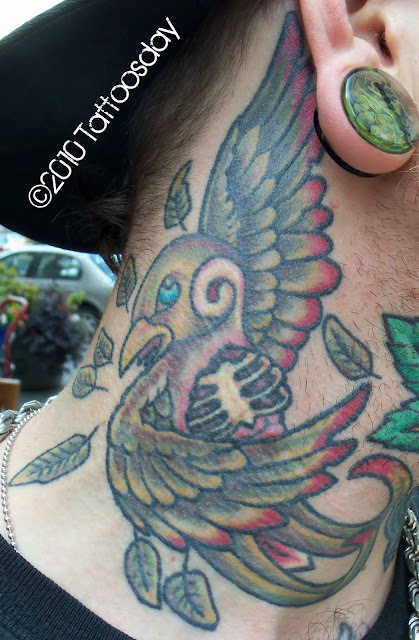 Tim added that the yellow highlights in the tattoo are a subtle tribute to Hulk Hogan. Thanks to Tim for sharing his tattoo with us here on Tattoosday! Last month I was trying to figure out why so many interesting people were walking around the Penn Station area when a trio of tattooed guys enlightened me: it was the Friday commencement of the New York Comic Con. Now, I realize, I could go to one of these events and have a field day with some amazing tattoos on some very committed fans, but then I'd also be writing up posts for another month or two, as well, so I was content to chat with Rob and his two friends (who will appear in subsequent posts - stay tuned-). 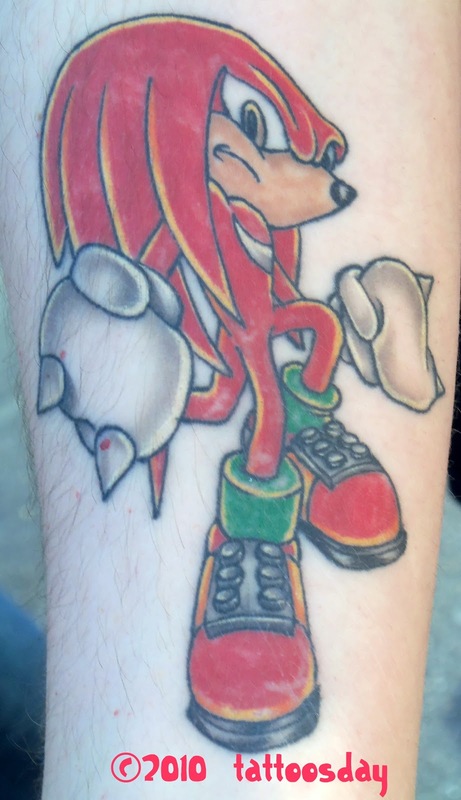 This is, I'm sure many of you may know, a character from Sonic the Hedgehog, an iconic video game series that appeared in the early 1990's and has since sold, according to Wikipedia, 70 million units worldwide. Rob explained that he grew up playing Sonic games and his favorite character was Knuckles the Echidna, who first appeared in Sonic the Hedgehog 3. "He was the only one I wanted to be," Rob told me. An echidna, by the way, is another name for a spiny anteater. Rob credited this tattoo to "Debbie Doo" at Skin Deep Tattoo in Levittown, New York. 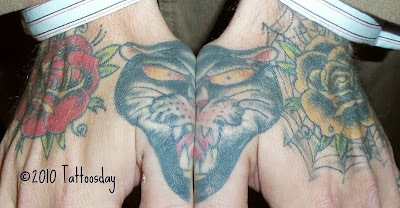 Thanks to Rob for sharing his Knuckles Tattoo with us here on Tattoosday! Let's take a moment and pause from our regularly-scheduled programming this Veteran's Day to remember the men and women who serve our country bravely. 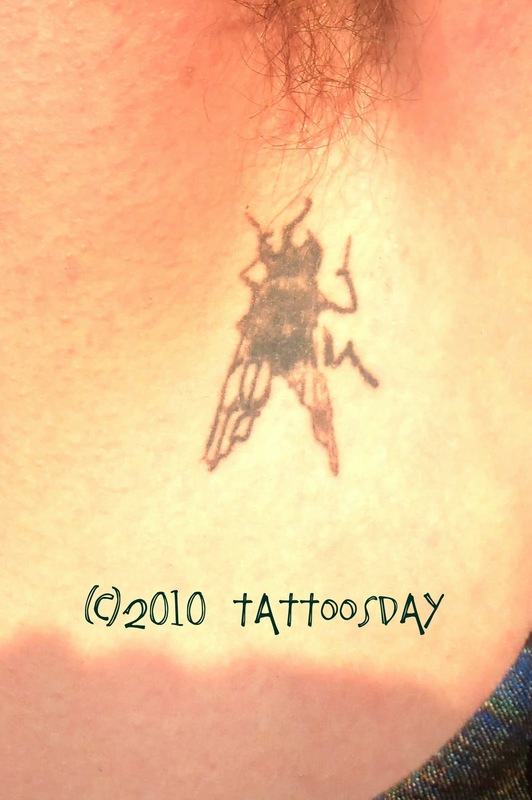 I've dug into the archives and reposted a friend's tattoo, which appeared originally here on Tattoosday in January 2008. Be sure to thank a Veteran today, and to appreciate not only our soldiers at home and abroad, but their families who support and inspire them to serve our country courageously. I explained the blog and asked if she'd like to participate. She was happy to oblige and, as fortune would have it, she was coming to an indoor soccer game the following day. Her nephew plays on the same team as my daughter Shayna. Tracy's husband Pete subsequently returned from Afghanistan, but has since returned to duty overseas. 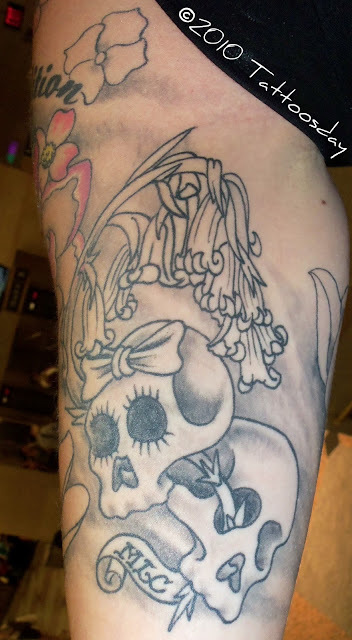 On behalf of all of our Tattoosday readers, I want to thank Tracy and Pete, for their commitment and sacrifice, and for sharing this one story among thousands, with us here at Tattoosday. I spotted Timothy one afternoon near the intersection of 31st Street and 7th Avenue. One can see some of the work on both legs. In the background, you can get a fairly good idea how nice the dragon is on his left, Japanese-themed leg. His right leg is devoted more to "Black Magic," hence the baby voodoo doll on the front of his shin. The tattoo was done by Ox at Jinx Proof Tattoo & Body Piercing in Montclair, New Jersey. 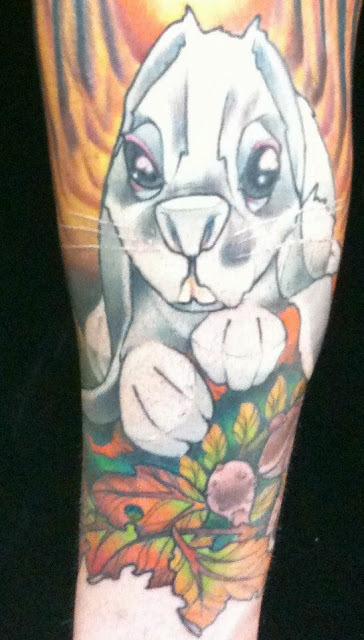 Thanks to Timothy for sharing his ink with us here on Tattoosday! This past Sunday, tens of thousands of runners gathered for the ING New York City Marathon. As luck would have it, yesterday I had the good fortune to run into Gavan, an Australian runner who had completed the marathon (his 24th!). 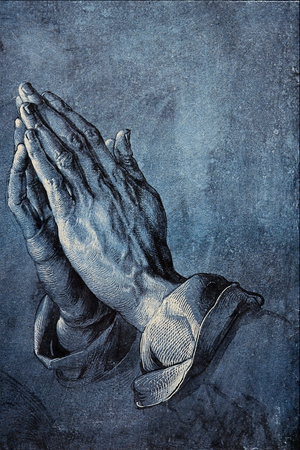 Gavan explained that this was based on a work of art by Albrecht Dürer called Betende Hände, or "Praying Hands." One story behind the work details the sacrifice between two brothers. praying during the birth of his second son, beseeching a higher power, "Please let him be okay". He believes that the prayer travels with him, as he is separated and not always with his sons. His journey as a marathoner carries him to faraway places, as well, and these absences are tinged with worry over the well-being of his kids. Please let them be okay. As life progresses and he grows older, these hands become more and more significant. 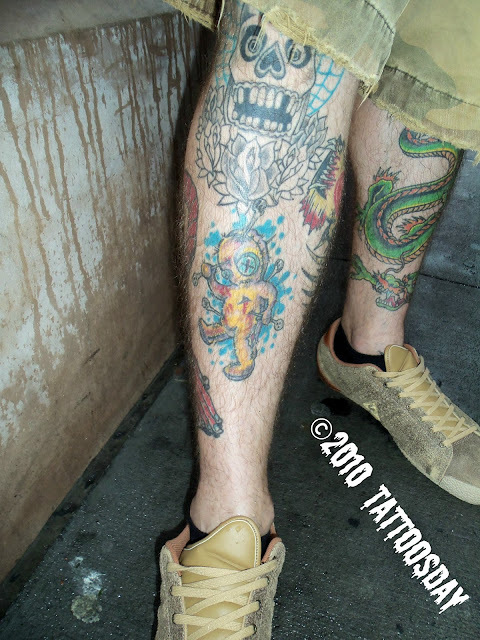 Gavan's tattoo is also striking in that the tattoo is on the back of his leg, and he is a runner. To complete a marathon, I believe, takes more than stamina and training. One must also have faith, whether it be in a higher power or the ability to push one's body to complete an astounding task of strength and endurance. I also wonder how many runners this past Sunday saw Gavan's tattoo ahead of them, and drew strength from the image before them. Gavan credits this wonderful tattoo to Jane Laver at Chapel Tattoo in Prahran, a suburb of Melbourne, Australia. There's a nice profile of Jane here. 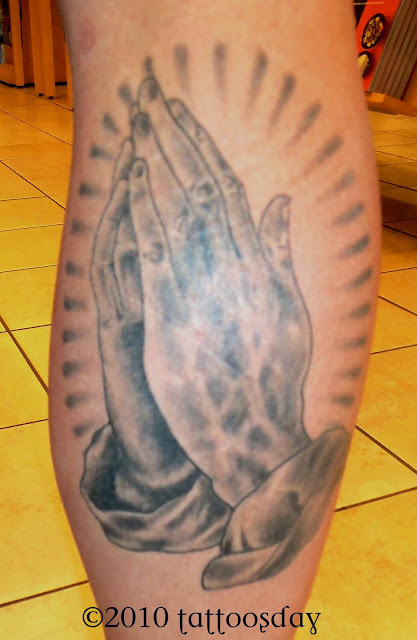 Thanks again to Gavan for sharing his hands of prayer with us here on Tattoosday! Congratulations on a race well-run and thank you for visiting our metropolis. We hope you have an enjoyable stay and pray that your return home safely to your two boys back in Australia! I spotted Megan at the end of September walking down West 23rd Street in Chelsea. This tarot card is significant because her mother is from the Caribbean and she grew up with Santerían religion in her household. She has a profound respect for tarot cards and based on the time and date of her birth, has what she refers to as a "weird numerology". The Empress seems to be sure of herself, calm, intelligent, worthy. This major arcana represents the capacity, the Empress clothing is luxurious and invaluable. ...In the right position the Empress represents the intelligence, dignity, the authority, the mother, the wife, the right decisions. 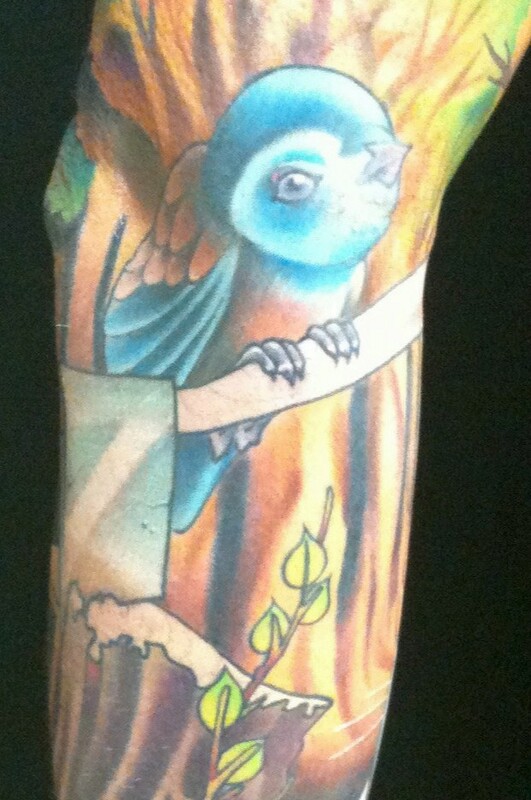 The art was inked by Annie Lloyd at Three Kings Tattoo in Brooklyn. 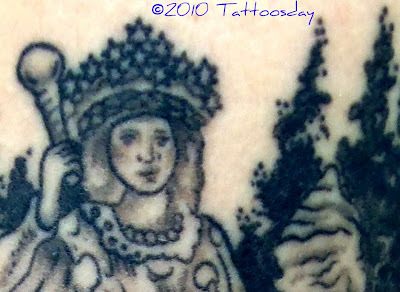 Work from Three Kings has appeared previously on Tatoosday here. Thanks to Megan for sharing this lovely tattoo with us here on Tattoosday! I met Brandice in Penn Station back in August, as she sat on the stairs by the New Jersey transit terminal. 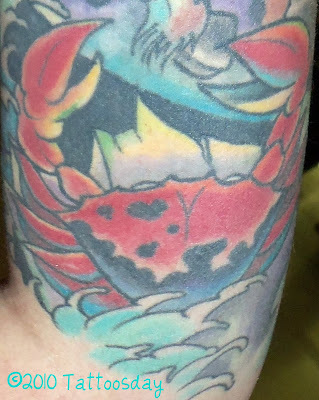 She shared her half-sleeve-in-progress on her right arm. Brandice explained that her work is a tribute to her family. The Confederate Flag is a nod to her family from the South, most of whom come from Virginia. I had to ask if she had any reservations about inking the flag on her arm, since some people see such a symbol in a negative light. She acknowledged that she took this into consideration, but decided that it is part of her family history, and that when she explains this to people, they understand. She does not wear it to make a statement but, rather, to honor where her family is from. 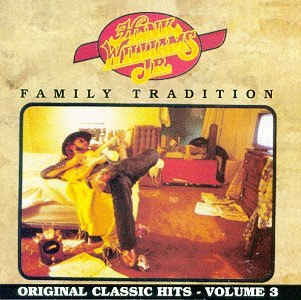 The "Daddy" is a memorial nod to her father who passed away and the phrase "Family Tradition" reinforces the central theme of the tattoo, and further acknowledges her Southern heritage.This is an allusion to Hank Williams, Jr. and his song (and album) "Family Tradition". and the skull with the bow represents herself. The banner bearing the initials MLC is a nod to her grandmother. She has used symbols to represent the living and names for those who have passed. The dogwood flowers in the tattoo have religious meaning as well, in addition to being the state flower and state tree of Virgina. The magnolias are also shout-outs to her southern family heritage. Brandice has about eight hours of this tattoo done so far, all by Dan Paone at White Lotus Tattoo and Art Gallery in Tom's River in New Jersey. Thanks to Brandice for sharing her tattoo steeped in family traditions with us here at Tattoosday! I met John walking down 7th Avenue in the upper 20s back in the beginning of September. Fans of the popular British graffiti artist Banksy will recognize this as a tattoo based on his work. 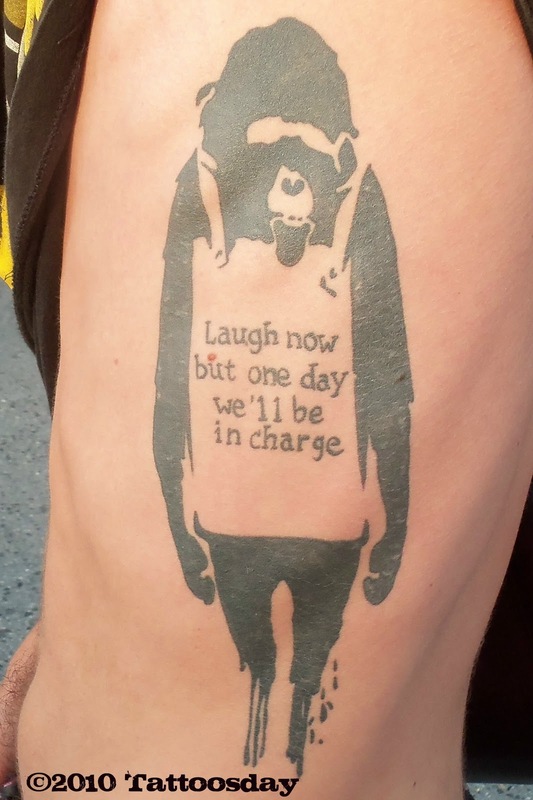 Another Banksy-inspired tattoo appeared here on Tattoosday in October of 2009. Why this design? Aside from the fact that John likes the imagery, he especially likes the dripping effect at the bottom of the piece, as if it was spray-painted on. 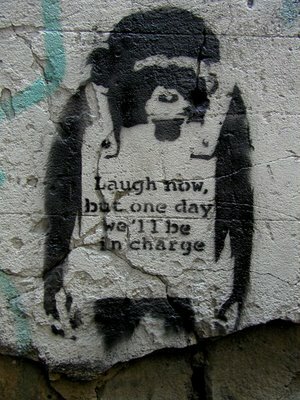 He also related to the ape's sign that reads "Laugh now but one day we'll be in charge". The piece was inked at Tattooville in Neptune, New Jersey. Yes, that's a fly tattooed under his right armpit. John explained that this was tattooed by an artist under the moniker "Porkchop" at Asbury Park's Parlor Gallery. It was part of an occasional event called "Fly Day Friday". If that sounds bizarre, it gets even crazier. If you present Pork Chop with an item that was bought for under $5.00, and he finds it valuable, he will trade it for one of his fly tattoos. John successfully presented an item and got the tattoo in exchange. "What did you offer?" I asked. 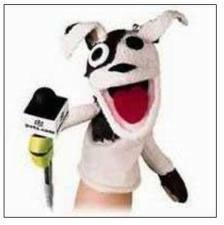 "A Pets.com sock puppet," he replied. Thanks to John for sharing these unusual tattoos with us here on Tattoosday!